If you’re looking for your next beach vacation destination, look no further than the U.S. Virgin Islands (i.e. no passport required). Probably one of the most overlooked destinations in the Caribbean, the U.S. Virgin Islands are home to the beautiful St. Thomas, St. John and St. Croix, each oozing with their own unique charm. Pristine beaches, extremely friendly locals and a wi-fi signal so weak you’ll be forced to be present (gasp!) make these islands an ideal travel getaway. Perhaps though, one of the best ways to explore the U.S. Virgin Islands and experience the warm hospitality is through your taste buds. Caribbean cuisine on the islands is heavily influenced by the long history of previous inhabitants creating a fusion of West-African, European and Danish flavors. The eclectic dishes are meat and fish-heavy and highlight the freshest produce the islands have to offer and it’s not uncommon to stumble upon a food festival taking over the streets. Read on to find out where you can find some of the most authentic and savory Caribbean fare on the islands. You may recognize The Buccaneer Hotel from a small little show called The Bachelor (don’t worry, we won’t judge) but the charming resort has also been frequented by heavy hitters like Vice-President Joe Biden, Michael Jackson and Kirk Douglas which means it’s worth a visit. 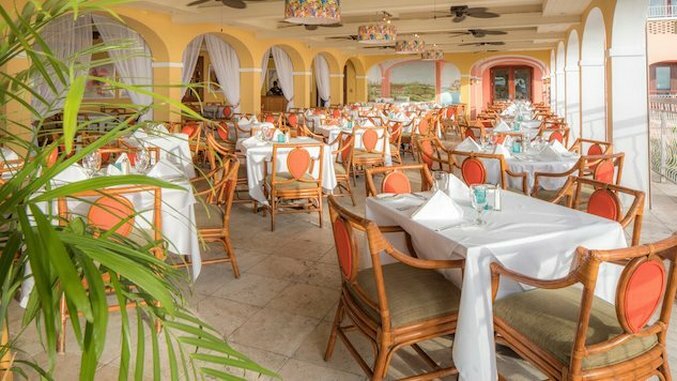 The oceanfront oasis has an 18-hole golf course, eight tennis courts, three magnificent beaches and several dining options including the open-air restaurant, The Terrace which offers a classic menu with a dash of Caribbean flair. You will surely want to sit along the perimeter so you can get a front-row seat to the views of the Caribbean Sea. Seafood options are aplenty, but if you’ve built up an appetite, the New Zealand grass fed filet mignon is an excellent choice. Don’t pass up the impressive wine list which includes the beloved Justin Cabernet Sauvignon from Paso Robles. No trip to St. Croix is complete without a visit to the not-so-secret La Reine Chicken Shack and the permanent long lines should be a dead giveaway that this is practically a St. Croix landmark not to be missed. As soon as you enter the grounds, you’ll be hit in the face with the smell of the slow-cooked rotisserie chicken on display in the back of this no-frills, open air restaurant. Watch the rotating rows of seasoned whole chickens sweating against an open flame and then wipe your drool as you make your way to the counter. You can’t go wrong with anything you order here, but for just $7 you can feast like a king and get half a rotisserie chicken, two Johnnycakes and a side of your choice (we recommend the potato salad). Take one bite of the juicy, tender chicken (utensils optional) and you’ll find out why La Reine Chicken Shack boasts some of the best barbecue on the island which has attracted locals for 30 years. St. Croix’s latest culinary hotspot is brought to you by local native, chef Digby Stridiron, who created a contemporary West Indian menu inspired from his globetrotting days. Balter, derived from the Danish language, meaning to dance without rhythm or care, opened its doors about a year ago and has remained true to its sustainable menu sourcing ingredients from local farms like ARTfarm. The trendy eatery has been a long time passion project of award-winning chef Digby Stridiron who wanted to give back to his hometown so he partnered with local artists to showcase their work throughout the restaurant. Walk past the art that adorn the halls and you’ll find yourself in an airy, colorful, string-lit patio with live acoustic music playing and a humble garden with fresh herbs and fruits that will play a role throughout their daily menu. The eclectic farm-to-table dishes include highlights like a bread-fruit crusted roast chicken and a charred shrimp tagliatelle. For the grand finale and a sweet treat to keep you cool from the island humidity, don’t miss out on the brightly-colored scoops of sorbet made with nothing but fresh local fruits. Located inside the beautiful Gallows Point Resort, Ocean 362 pays tribute to Caribbean food with a modern twist. Executive Chef Shaun Brian proudly sources fresh and local ingredients to create an island to table menu that highlights traditional dishes and island flavors. Dishes like the St. Croix conch fritters are a must — often overcooked, but when prepared properly as done at Ocean 362, the fried delicacy is scrumptious. For the main course (and a party in your mouth), order the cast iron local fish which is a catch of the day served in a bath of lobster broth infused with Thai flavors like lemongrass sitting on a bed of coconut rice. The vibrant and flavor-packed dishes trickle down to the dessert menu with a lemon cake that is subtle enough to let the citrus shine but not overly intense. Reserve a seat on the outdoor deck and enjoy the sounds of live music (on select evenings) while overlooking the ocean. Located in the middle of downtown Cruz Bay, Hercules Pate Delight is a popular stop amongst locals for a quick breakfast snack, but get there early to enjoy them hot (and before they’re all gone). Pates are a traditional island street food, similar to empanadas, made of deep fried pockets of dough stuffed with various fillings like chicken, salt fish, conch or seasoned meat. The tiny eatery is ideal for takeout, so order one (or three!) of the delicious fried treats at about $2-4 each to hold you down for a full day of fun in the sun. Pair your pate with maubi, a fermented tree-bark based drink that takes a year to make and is what locals consider to be an epicurean delight. Arguably, one of St. John’s most authentic and beloved dishes originates from this family-owned restaurant. The oxtail stew at De Coal Pot is Caribbean comfort food at its finest — braised tender meat slides right off the bone and into a mixture of vegetables and savory juices that you will shamelessly want to bottle up to go. Probably one of the most traditional Caribbean dishes, this particular version of oxtail stew from De Coal Pot attracts locals and tourists alike. Each entree includes three side dishes with favorites like sweet plantains and fungi (a local side dish made with cornmeal). In the heart of Charlotte Amalie lies a local gem that was made for diners to feel right at home — the home-style cooking and Caribbean hospitality at this eponymous restaurant will fill your belly and warm your soul. As soon as you walk in, you’ll notice a colorful bowl of hot peppers sitting on top of the bar used to make a variety of hot sauces that will eventually get bottled and make their way to each table (a common practice in the USVI). You will also find a menu filled with delectable signature dishes that pay homage to Caribbean cuisine including the vegetable-heavy kalaloo, a stew made with spinach, okra and eggplant topped with smoked chunks of turkey, as well as the traditional fungi side dish and conch fritters. The upscale, Italian-inspired restaurant tucked away at the Ritz-Carlton St. Thomas serves familiar dishes like caprese burrata, rigatoni alla bolognese and branzino using a combination of imported ingredients like prosciutto from Parma and locally sourced seafood. Try the pan-roasted branzino sitting in a pool of velvety Pinot Grigio sauce or if you opt for a meat dish, pair your meal with a delicious red wine from Piemonte and enjoy panoramic views of Great Bay while you sit on the outdoor patio.